My lovely friend and Haute Whimsy sponsor, Jill, is celebrating the debut of her shop's new branding. Once called Creative Manifestations, this new Delicate Industry is dedicated to providing even higher quality handmade jewelry! The shop has been revamped and is now a little more fabulous! In celebration, Delicate Industry is giving away this whimsical Lucky Key necklace! 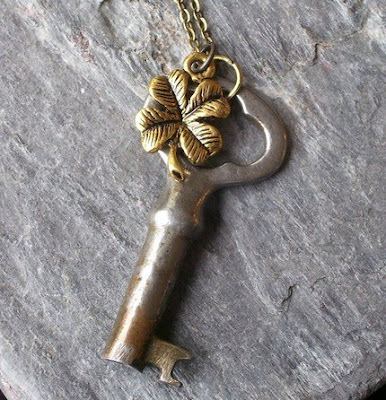 It's such a perfect piece for the month of March with it's golden clover for St. Patrick's Day and it's key which makes us think of Alice in Wonderland! Rules: This giveaway will run until 11:59PM on March 14th. If you'd like a chance to win, please visit Delicate Industry and leave a comment below with your favorite pieces! If you'd like additional opportunities to be the winner, you can link this post on Twitter, Facebook and Myspace (or any other social network) once a day for the duration of the giveaway. You can also blog about about this giveaway on your own blog. Just leave the link of proof in separate comments below. Word of mouth is the greatest advertising, so please help introduce Delicate Industry to the world! Congratulations to our winner, Anne! The Te Amo necklace is totally cute, one of my favs. I also love the grace assymetrical piece and the subtle threats are adorable in a bad girl kind of way. I love the delicate threat necklace! So funny and pretty. lol. That is adorable! What a great piece! oh my, that is so pretty! Count me in, pretty please *bats eyelashes* and how am I supposed to choose one from those 131 whimsical stuffs??? ah right, I have to, wait... I think it's gonna be the looking glass necklace, lol. multifunction! I checked out the shop & think this necklace is my favorite. Thanks for chance to win! Ooh, so many absolutely lovely and gorgeous things! I love the 'on a dark night' ring and all the little necklace charms--the bicycle one, all the keys, the little fan--so cute! i love how truly vintage her pieces are, and how much history must be involved in each one. the Noir ring. vintage gem. is by far the loveliest in my eyes. A wonderful mix of steampunk & femininity! and of course the necklace reserved for the giveaway! Hi Jen. Thanks for hosting such a cute giveaway. I really love her She's industrious necklace and the flapper ring both. I'm crazy about the one she is giving away. Please include me in your giveaway. I absolutely love the 'grace necklace' but I already own that one :) It is impossible to pick a favorite for myself, but this necklace would be perfect for my friend Brie. Seriously though, if you haven't purchased from Jill yet, do so. I bought all my bridesmaids necklaces from Jill and I cannot wait to see how excited they will be to open these perfect pieces and love them as I do! Yay Jill, you're awesome!! I would have picked the Lucky Key necklace, actually. My hubs and I got married on St. Patty's Day, so this necklace reminds me of that. I love the gear pendant...and this necklace is a favorite too! Thanks for sharing! the coloring is gorgeous ,the combo is fabu. :) love your etsy! I love the crystal ball. charm... So many beautiful pieces. WOW these pieces are amazing! A delicate threat. medium necklace. I absolutely love how delicate and vintage the pieces are!!!!!!!!! My favorite is the Peridot studs. They are all lovely but my favorite is the Ebony pear. vintage gem necklace! So simple and elegant!